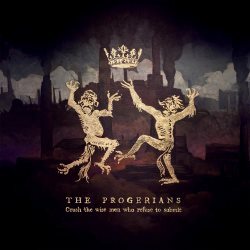 Three and a half years ago, I was pleasantly surprised by the debut longplayer The Fabulous Progerians by Belgian sludge / doom / punk rock band The Progerians. They may not have reinvented any musical genre, but their heartfelt performance made sure that their album stood out from likewise records. After a lengthy break they are back with a second longplayer, and where the debut came with eleven tracks averaging four minutes each, the new album is a double vinyl record with nine tracks averaging seven minutes each. It is known that sludge / doom bands occasional like to lose themselves in repetitive structures, which might explain the longer songs, but The Progerians truly made a quantum jump on Crush The Wise Men Who Refuse To Submit and not only reinvented themselves, but possibly even the genres they claim to be playing. The songs are not only longer than on the debut, but the band is also unafraid to allow unexpected genres into their music, making this hour-long double album an exciting rollercoaster ride through forty years of rock music. The opener Frankie Leads To Death starts with a mesmerising drone part, before nearly four minutes into the song, the guitars join in, transforming this twelve minute behemoth into a lava-like crawling monster. The following Destitute adds a little more groove with a soulful chorus that shows some stoner rock influences. The guitar solo at the end is also from out of this world. Side B starts with the psychedelically amazing Hold Your Cross that comes with French rap vocals (!) and later an atmospheric vocal part. Oceania has an electronic beginning with deep, hypnotic vocals before it turns into one of the band’s idiosyncratic stoner sludge doom monsters. The second vinyl’s A-side begins with the concise title track which comes full of punch, before Hello World and Graven add more psychedelic and even jazzy parts, the latter being emphasised by a really great electric piano part. The final vinyl side starts with Netjeret, full of heavy rocking groove, and the concluding Manifest, a foray into early doom metal. After such a long break, I didn’t expect much innovation from The Progerians, but the quartet from Brussels had really surprised me in a positive way. Crush The Wise Men Who Refuse To Submit is an entirely new take on sludge / doom / punk music, and with elements of psychedelia, jazz, progressive rock and rap, it offers the listener a heady mix that should leave no one indifferent.